Designed for working moms who are still breastfeeding, the Nurse Purse is a stylish step up from the standard-issue black nylon bag. With a sturdy removable insert that holds your breast pump securely in place, water and stain resistant fabrics, and room for all your essentials, the Nurse Purse is the only bag you'll need. Designed to hold your pump, cooler, all your gear and your personal items - it's the only bag you'll need to carry. Be a great mom - you don't have to look like one. Compatible with most brands and models of breast pump. 100% cotton canvas with a water-resistant nontoxic finish. 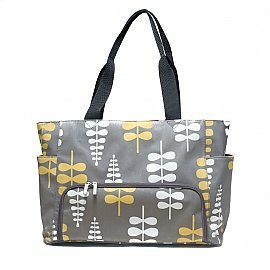 Adjustable, removable insert - converts to a diaper, tote or gym bag. Room for a laptop, personal items,bottles and cooler bags. If you have any questions about this product by Nurse Purse, contact us by completing and submitting the form below. If you are looking for a specif part number, please include it with your message.